Launched by the Family and Youth Services Bureau (FYSB) in November 2017, the National Clearinghouse on Homeless Youth and Families (NCHYF) is a national resource for organizations that support runaway and homeless youth and their families with programs and services. FYSB, which is part of the Administration for Children and Families within the U.S. Department of Health and Human Services, is responsible for supporting organizations and communities that work every day to put an end to youth homelessness, adolescent pregnancy, and domestic violence. 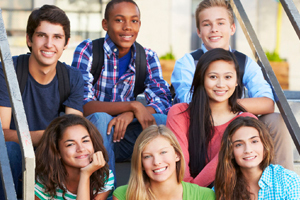 NCHYF provides information and resources to FYSB Runaway and Homeless Youth (RHY) Program grantees and other organizations that are developing and implementing prevention and intervention services for runaway and homeless youth and their families. NCHYF also serves the general public interested in learning about the issues facing runaway and homeless youth and the circumstances that contribute to their running away or becoming homeless, including intersecting issues with FYSB’s other program areas, Adolescent Pregnancy Prevention (APP) and Family Violence Prevention and Services (FVPSA). We encourage you to visit the APP clearinghouse, The Exchange, and the FVPSA resource center, National Resource Center on Domestic Violence, for more information specifically related to their programs. NCHYF works in partnership with other organizations supporting runaway and homeless youth, including the Runaway and Homeless Youth Training & Technical Assistance Center and the National Runaway Safeline. Tools to help grantees fulfill their responsibilities, and do their work more efficiently and effectively. Through these services, the NCHYF fosters collaboration between the local, national, and federal agencies that serve this vulnerable population. NCHYF welcomes your inquiries and feedback. Please get in touch! We look forward to hearing from you!